In a consumerist society, it’s easy to get carried away, to want more of everything. It seems like almost everyday, there is a “sale” or promotion that is enticing us to buy more stuff. Stuff we might not even need but in order to get that free shipping or that discount we need to spend a certain amount. Some of us don’t even know how much things we have anymore and while excess consumption may lead to faster cars, the newest trends, and better technology, it also leaves us with cluttered homes. I am guilty of the overflowing closet that can’t be shut without putting some muscles into serious action, the fancy kitchen appliances that clutter the counter tops, and the latest technology that never brings happiness. Instead of helping me to reduce stress, these things only added to it and managing it all was taking away time I desperately needed more of. After reading various books such as The Life changing Magic of Tidying up by Marie Condo, I realized that my attempts to manage clutter was deeply flawed because I failed to do one fundamental thing, learn to let go. Instead of getting rid of the stuff I didn’t really need or use, I thought that the solution was to get more storage to put all these things in. I often found myself saying if only I had more space or more storage, my house would be less cluttered. I admit that the hoarder in me found it very hard to accept that the first step to managing clutter was to reduce. Alhamdullilah, now that I have finally learned to gracefully let go of things, I can not tell you how liberating it is to finally be able to find things easier, and to look into an drawer that is not a hot mess. Marie Kondo in her book describes how tidying up can have far more impacts than just having a cleaner home, it can in fact change your life. When we have less things, we are able to hone in more and to see things clearly. As a result, we start to have a clearer direction of where we want to go in our life. Because we only keep things that we need and love, suddenly we are able to see and pick up that book we’ve always wanted to read because it’s no longer hidden between countless of other books. We can finally finish that special project that we never got around to doing because it’s no longer lost among countless stuff, and we now have more time to do it. We might even realize that we want to pursue other passions or change career paths. The reason why people go through these life changing experiences is because the whole tidying process as prescribed by Marie Kondo is akin to coming into terms with who we are as a person. It may be as simple as affirming to yourself that you are the “casual-type” who doesn’t need that sequin dress that has never been worn but is still in your closet or it can be an even deeper reflection that might make you want to change your career for something more meaningful but you were always too busy or too scared to pursue. So in the process of sorting out your house, you end up also sorting up your life. If you allow yourself only to keep a few select items, then most likely they will be the things that you will value and take care of. When you have less stuff, you also learn to appreciate what you have. Surrounding yourself with only things that you like can positively affect your mood. They don’t necessarily have to be a lot of things, because sometimes it’s also the empty space that speaks for itself, and tells us what is no longer important to us, so we can see what is. Many of us have things we keep around because we feel bad about “losing” the money we spent on it. But if it’s something that we no longer use or value, it’s only fair that we allow it to find a new home. 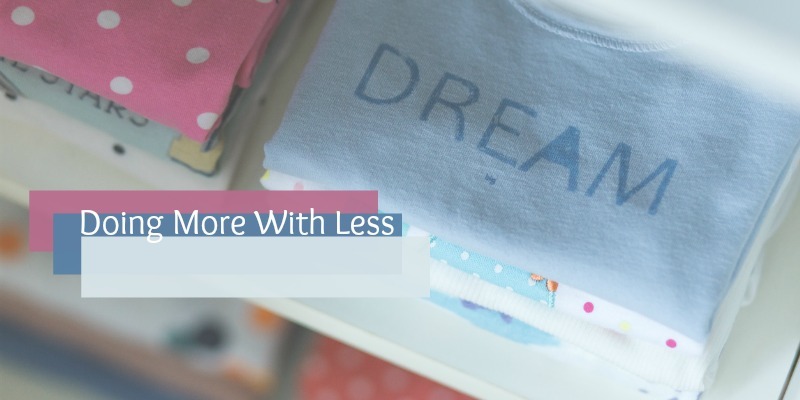 Keeping clutter around your house will actually cost you more (in terms of your stress levels, and the space it takes up) than the actual value of the item. Evaluate and get rid of (if necessary) any gadgets you don’t use. Many of us buy gadgets on impulse and realize later on that they are not as useful as we thought they would be. Once the novelty phase wears off, they end up just collecting dust as well as eat up precious shelf/counter space. Don’t get too creative with your sock collection! Stores nowadays will try to sell you an array of “fun” colorful socks. They look nice at the store, but are a nightmare in my opinion especially for kids, because everybody knows that 1 out of every 2 socks go to a special place never to be seen again. After years of learning the hard way, I put away a few special socks away (for fancy occasions) and for everyday use I give all my girls the same type of socks (white) while my son wears only black socks. Throw away any manuals and empty boxes from appliances. You can access all that information online, and the box is eating up valuable space that costs more in rent than the money you would get if you resold the item with its box. If you are a Hijabi, minimize your scarf “collection,” by buying mostly popular solid colors, or a few hijabs that work with your outfits. It’s easy to get carried away with all different patterns and styles out there, but selecting neutral colors will make ensure that your hijab gets more usage out of it, and that you will need fewer hijabs. Go through your library and donate any books you have already read, or books you probably will never read. Although it’s highly unlikely, most of us hold on to books thinking that there is a chance that we might read it one of these days. If you haven’t read it in years, you will probably never read it! And if it so happens that you need it in the future, you can always buy or borrow it again, but this time you will most likely be more compelled to finish it. Glad it was helpful Alhamdulilah.